Heat oven to 375°F. Lightly grease 9-inch cast-iron skillet with shortening or spray with cooking spray. In large bowl, beat cookie mix, 1/2 teaspoon cinnamon, the vanilla and eggs with electric mixer until just combined. Add 1/2 cup butter; beat until smooth. Spread mixture in skillet. Bake 25 to 30 minutes or until toothpick inserted in centre comes out clean. Remove from oven; place skillet on cooling rack. Increase oven temperature to 425°F. Grease baking sheet with shortening or line with cooking parchment paper. To make Oat Topping, in small bowl, stir together oats, brown sugar, granulated sugar, flour and 1 1/2 teaspoons cinnamon. With fork, mash 1/2 cup butter into dry mixture until crumbly. Sprinkle water over mixture; stir briefly. Spread mixture on baking sheet. Bake at 425°F 5 to 8 minutes or until mixture is golden brown around edges and bubbly in centre. Remove from oven; break up topping with fork. Topping will be soft at first, but will harden as it cools. Cool topping completely on baking sheet. 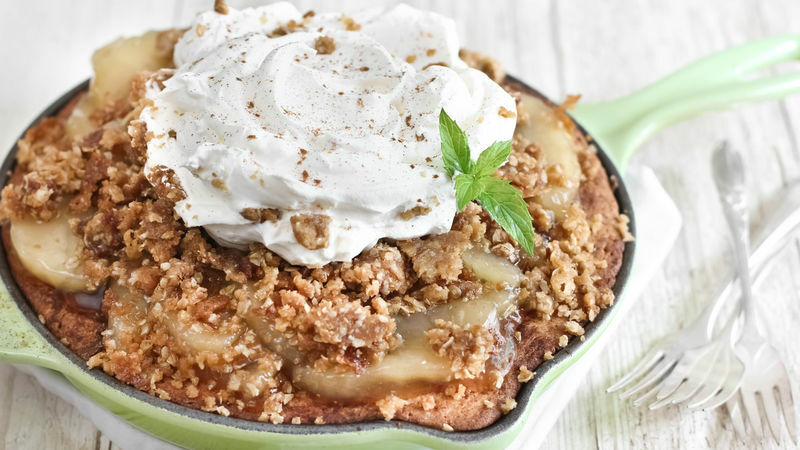 Top Snickerdoodle Cookie Base with apple pie filling. Heap oat topping over pie filling. Spoon whipped topping onto top centre of dessert; sprinkle with additional cinnamon. Store in refrigerator. Whipped topping can be served on the side, if desired. Reheat servings in the microwave on High in 30-second increments and serve with vanilla ice cream.